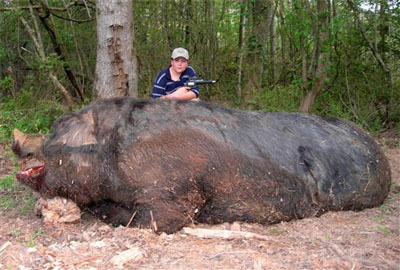 An 11-year old boy recently shot and killed the largest pig ON THE PLANET. MONTGOMERY, Ala. (AP) - Hogzilla is being made into a horror movie. But the sequel may be even bigger: Meet Monster Pig. An 11-year-old Alabama boy used a pistol to kill a wild hog his father says weighed a staggering 1,051 pounds and measured 9-feet-4 from the tip of its snout to the base of its tail. Think hams as big as car tires. I have no clue how that little boy managed to bring down that monster. If this was a movie, he didn't, and that hog is going to get up and EAT that boy. That thing just doesn't make any sense. I mean, it's the size of a bear. Update: Oh good. It turns out that this is a fake. Thank goodness! I was at the Greyhound bus station in Columbus, Georgia - right outside Ft. Benning, on the border of Alabama - the day this story broke and saw this as the headline story on a local newspaper. My disbelief was the same as your's. I just can't imagine that thing wandering around the woods in the wild. p.s. He brought down the beast with a .50 cal revolver and something like a 3 hour chase - not to mention a massive amount of guts! It's weird to picture an 11-year old firing off a .50 cal. I mean... in the picture, the gun is half the length of the kid's arm.